For us Halloween is a marathon, not a sprint. That isn’t to say it is bad; it is just long, stretching over days or weeks if you count all the preparation. It all starts months in advance when the boys decide what they want to be for Halloween. I have a sickness that prevents me from buying pre-made costumes (I know, but at least I acknowledge it.) 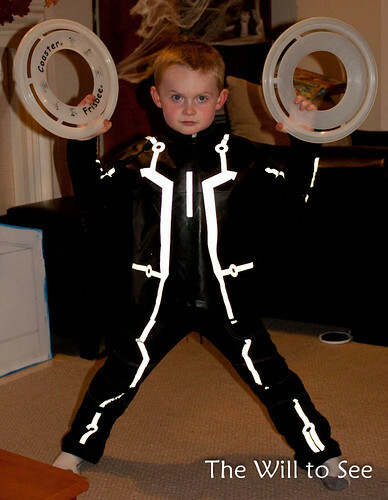 This year Jack decided he wanted to be Sam Flynn, the main character in the movie, Tron Legacy. 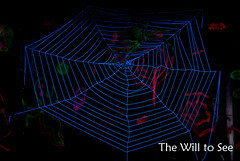 Since Will doesn’t have an opinion yet, the plan was for him to be either the character, Tron, or Rinzler. I was going to try to make Jim and I costumes too, but that idea got thrown out due to lack of time. 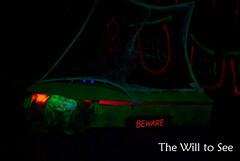 Jack’s costume came together well and I even found some glow in the dark Frisbees that look like the disks. 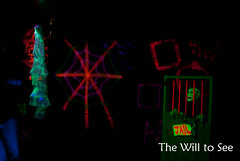 However, Will’s was just too plain. After I saw it together on Friday I knew he needed something different. 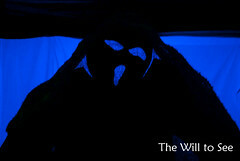 Last Friday (like last year) we chaired the haunted maze for the Halloween Bash at Jack’s elementary school. Since we did so much of the building work last year it made sense to take it on again. 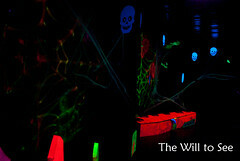 We were able to add more black lights and decorations to fill the space of the maze better, including a second coffin, jail, mummy man and zombie. 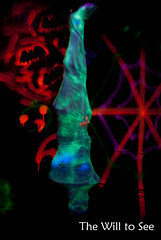 We were able to get some photos from inside the maze this year, thanks Jerry Ann from Deddo Arts. The Halloween Bash followed a walk-a-thon. Unfortunately the weather gods were not smiling on us and it poured rain, prematurely ending that part as people headed inside to get out of the garden hose that was coming out of the sky. 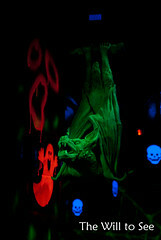 I think everyone still had fun at the 2nd annual Halloween Bash. 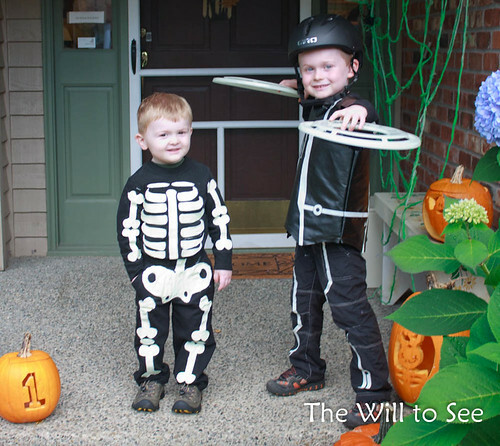 Saturday morning I decided to make Will a skeleton (“skelskin” as Will says) costume. Yes, two days before Halloween. It actually came together well and he was happy with it. Sunday night we carved our eight pumpkins with Allison, Dennis and their kids; well technically Dennis, Jim and I carved pumpkins while Allison cooked and the kids played. 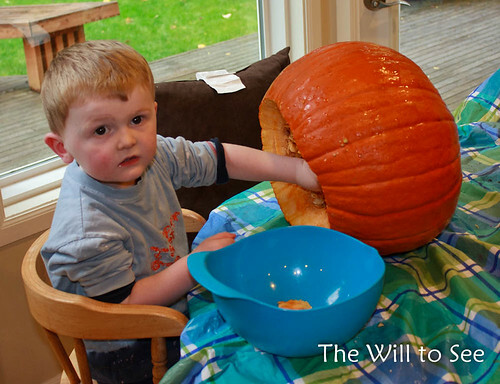 Next year Jack is going to help with his pumpkin. It is a memory I want him to have like I do. Then Monday arrives… Halloween on a weeknight is hard. It feels like such a race to get through everything, get the kids in bed at a reasonable time and remember to enjoy the night. The teachers were great and didn’t give homework. We trick or treated through the neighborhood in a group of 11 kids and eight adults with cocktails. The bigger kids quickly moved from house to house, while Will took his time. He just moves to his own beat and does what he wants. 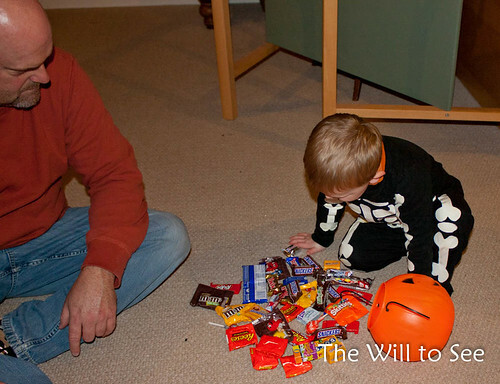 By the end of the night he would just ring the doorbell and say “I get candy now,” instead of trick or treat. We will work on his manners. I am blown away by your Halloween and those 8 pumpkins! And the homemade costumes etc. —> wow! I love it all, just wish I had more time. Wow! 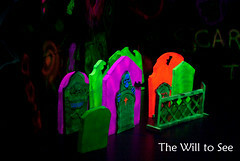 I love the glow in the dark haunted maze you created! So very cool. I also am blown away at all the pumpkins you carved, my lady! Busy, busy, busy! 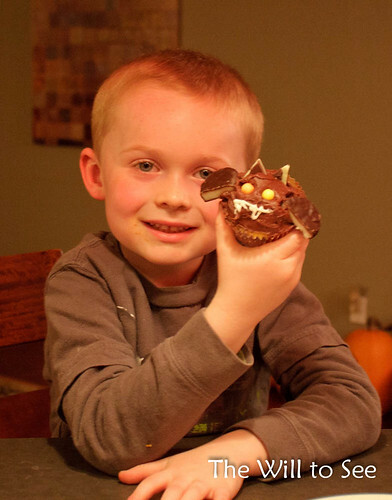 How fun for the kids – which- by the way, are very cute! Thanks. 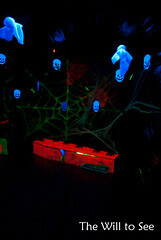 The kids at school love the maze and we can’t wait for next year. The costumes, the pumpkins, the maze!! Thanks. I just wish I had more time to do more.